The instant someone even mentions Badam Halwa, which is probably Almond Fudge to the rest of the world, my mind immediately goes to my dear grandmother. Every time she made a visit to our house, she would bring packets of fresh home made Pal Kova (doodh peda a.k.a Milk Sweet) along with absolutely heavenly Badam Halwa. In my house ( and probably for miles around), I am the only one who does not prefer sweets at all and would run away in the opposite direction. So while everyone thronged around my grandma for a piece of Pal Kova, I would try to disappear from that place. But not even me, ever could possibly stay away from her delicious Badam Halwa and I would inadvertently end up taking 1-2 spoonfuls of this sinfully yummy Indian sweet. You might think it does not sound much, but keeping in mind that I hate sweets it was quite a lot. I have never in so many years of stay at my grandma's place ever took trouble to ask the cook how he actually made the sweet, but now when I find that I have to make it for my family, I keep thinking of asking for that recipe. Somehow I always didn't mind eating my grandma's version to that of outside shops. Now I realize why! Almond by itself is a rich nut and to top it off, it is made even more richer by adding Ghee (clarified Butter) and sugar. But shopkeepers/commercial shops go beyond limits and add gallons of Ghee and Sugar to make it sickeningly rich ( at least for me) that even the smell makes me nauseous. I want it to be such that, this sweet is rich of Almonds and tastes so and is not corrupted with other richer ingredients. It should only compliment the almond taste and not take prominence themselves! 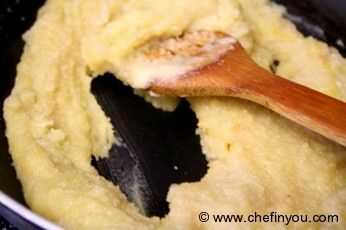 Though this recipe which I always follow is no way low calorie, I can actually say it probably is, compared to the ones you get in restaurants and shops :) The flavor oozes the richness of the almonds and is mildly sweet. You can of course increase both Ghee and Sugar to suit your preferences and taste :) This works for me. 1. 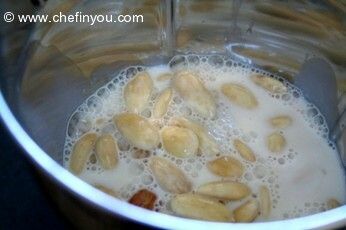 Take the blanched almonds and little milk in a food processor and grind it to a coarse paste. 2. Use milk as much as needed. You can mix it later while cooking the almonds. I usually add all the milk while pulsing the almonds. 3. Take a non stick pan. I would recommend using it, esp. 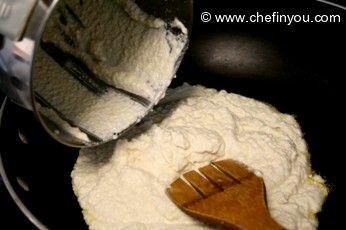 for beginners since it is helpful in making sure that your almond mixture does not burn as easily. Even a little burn will spoil the whole dish completely. Yeah! Finicky little sweet - but then as they say, totally worth it. 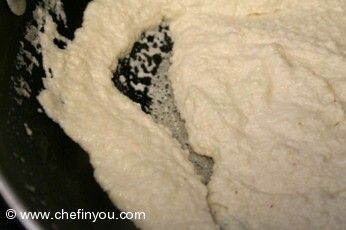 Pour about 2 tbsp of ghee and when little warm, add the almond mixture. You can add any remaining milk, if any now. 4. 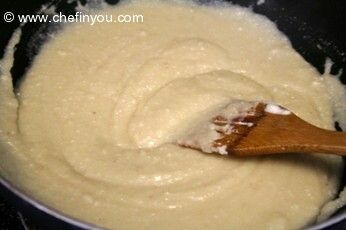 Cook the mixture in medium heat for 3-4 minutes, stirring all the while slowly to avoid sticking to the bottom. See how it sticks to that bottom here? 5. 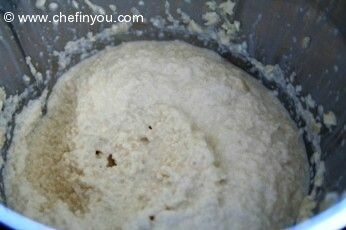 In the beginning, the mixture will keep sticking to the pan hence supervision(read stirring) is required. 6. 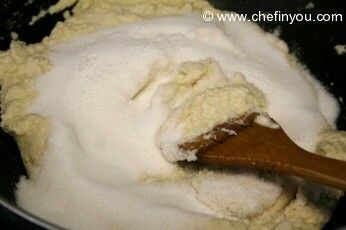 Now add the sugar, few tablespoons or 1 cup - whatever works for you - to the mixture. Mix well. 7. The mixture will become little more fluid thanks to all that sugar melting. I have known people to make sugar syrup and then add to the almond mixture. Gawd! The variety to make one single Indian sweet in so many different ways is boundless!!. But I find this method easier. I am not that pally with Sugar syrup fairy!!! 8. Cook for another 5-10 minutes until you see the mixture boiling. Be careful since the behavior tends to match molten lava - with the bubbles bursting and splattering all over you! Those hot pricks of the mixture is not a nice experience to have. :). Add the remaining 1 tbsp. of ghee and saffron at this point and keep stirring for some more time. 9. You know its done when the mixture comes together into one sort of thick lump. It stops sticking to the pan and also remember the hot air shooting of the mixture earlier? 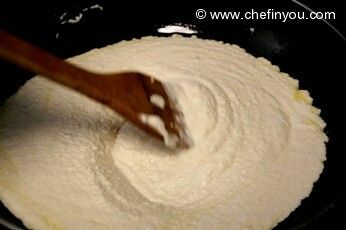 - that stops and the mixture looks sedated now, calmly moving and dancing around the pan with absolute ease when you keep stirring it. I think this totally takes around 30 minutes to get done. The color of the sweet also turns slightly golden thanks to the saffron. You can add red/yellow food colors for a more attractive color, if needed. You can now take a chill pill and flex your sore hand now from all that stirring! Your efforts are going to be paid off - Go ahead and take a spoonful of Badam Halwa and know what heaven might probably feel like :) The pain in your hand went away in a flash, didn't it? I tried this recipe and it turned out really good......... My husband who is not much of a sweet lover enjoyed it the most. Thanks for the recipe!!!!!!!!!! :-D nice easy steps .i will try. This is the only site i refer to if i want to make my favorite dishes:) Thanks DK. I dont really have to call my mom for any receipes these days:)It is made so simple and delicious by your effort.thanks again. I made this Badam Halwa. It turned out yummy. I was always scared of trying this because Iam not the syrup fairy too. But your recipe was simple and took less time to prepare.Thanks for the recipe. Thanks for the recipe.It came out very beautifully.Blanching the almonds was fun.My family enjoyed it :) :) :) . Very happy to find this since halwa recipes always seemed so complicated when explained by the Aunty's. For a first try ever, it came out really really good...at first I went by the recipe, but the result was a lump of badam "candy", so I put it back in the pot and cooked with 3 more cups of milk and came out more like kheer. I'm gonna try the vanilla cake next! Just wanted congratulate you on the wonderful job you are doing. I wanted to try making besan ka ladoo. 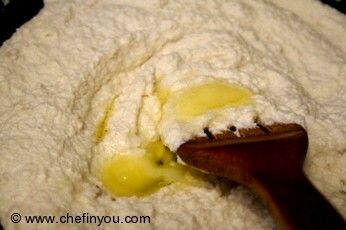 I stumbled on your to your blog last week and have tried several of your recipes already. Badam halwa came out very well. Today it is going to be Potato and Lima beans. I also like the fact the at the recipes are nutritious and delicious. Lastly, awesome pictures. hi....! very nice presentation . looking out for this recipe for quite some time...i am going to try it out today. thank u...! Tried this recipie today. Was an instant hit! Thanks and look forward to many more such recipies! How I wish I shared your aversion for sweets! Sweets, especially Indian ones, make me weak in the knee. And Badam Halwa is one of my favoritest! I love your low-sugar version. Yeah, I think I too have used 1C of sugar for 1C of Badam in the past. I tried the recipe yesterday. It tasted yum. The kids loved it and so did I. I wonder if the recipe will work if you make it with unpeeled, dry badam. This is the best looking halwa I have seen so far... Congrats and Happy Diwali!! Halwa looks fabulous in that beautiful dish. That looks so delicious! 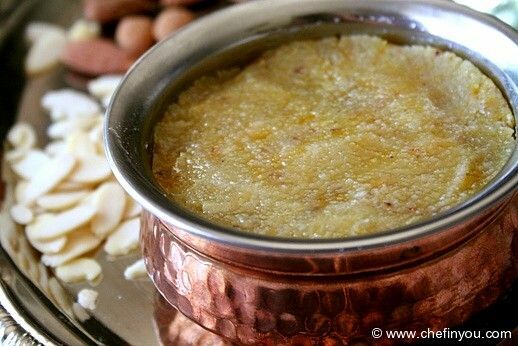 Badam halva is one of my favourites. thanks for the step by step pics..have bookmarked it. Even i don't like sweets much, had this once only when my mom was stuffng me up with fats post pregnancy...(i had one full bowl) . Was so so rich and too uch too, but tasted heavenly... Thanks for sharing.. Yumm!! 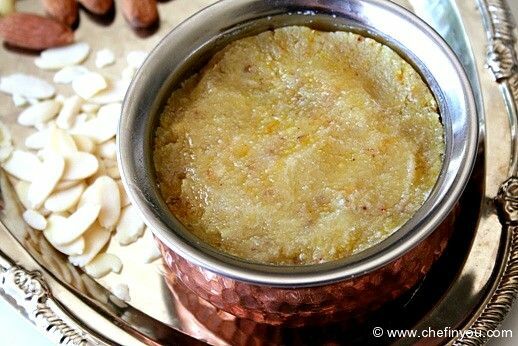 !such a lip smacking halwa..
very rich halwa...looks mouth watering..
Super Delicious Badam halwa. Great narration !!! 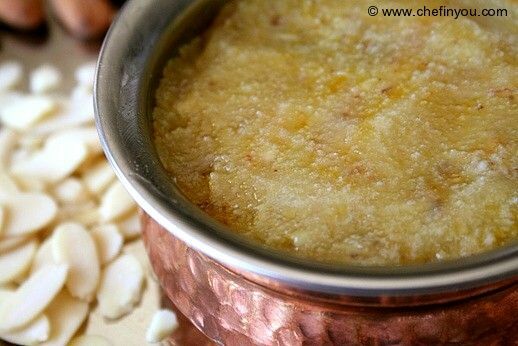 Once had the Badam halwa from Sarvana Bhavan @ vancouver and there was so much ghee from it that I could have made some more halwa out of it. I did`nt like the taste there. I too prefer making them at home. Looks mouth watering DK.. Yummyyyyyyy.